This character-driven play from Moving On Theatre had something for everyone. From romance to hatred, happiness to tragedy, there was no emotion left unturned in this provocative production detailing Edith Piaf’s life both on and off the stage. The dulcet tones and sultry swishes of Laurene Hope immediately transported the audience to another world of a time previous. The excessive personality that was so indicative of Piaf was translated in the perpetually passionate delivery of Piaf: Love Conquers All. What was initially striking was the simplicity of the set; this stood in wonderful contrast to the complex life the French songstress led. The difference between the two also appropriately foreshadowed the extremes of emotion that were to be purveyed throughout the performance. The first scene detailing her falling pregnant at fifteen with Petit Louis, the joy that came with the child they produced was very quickly replaced with the tragedy of Piaf’s inability to care for the child and its eventual death from meningitis not long after. In spite of her child’s death what continued to survive was Piaf’s zest for life and song. The excessive personality that was so indicative of Piaf was translated in the perpetually passionate delivery of Piaf: Love Conquers All. As a result of this, the production could simply not have been performed without mention of the many men in her life. Humorously highlighting her numerous lovers, the audience were most spell-bound by the one she shared with Marcel Cerdan. But, in yet another extreme shift in tone within the show, her joy soon disintegrates into drug-fuelled despair when he died in a plane crash. How Piaf’s life was depicted by Hope relied on the dichotomisation of her unceasingly tumultuous private life compared with her highly successful public one. That both aspects were covered was a clever move on the theatre company’s part as a result of it mirroring the mélange of confidence and vulnerability that made Piaf the adored individual that she was and continues to be. Always wearing her heart on her sleeve, this inability to hide her emotion was shown in the intimacy Hope shared with each and every member of the audience. Though tragedy was never far in the French star’s life, her final ray of sunshine came with her having the last laugh in leaving behind the pimps, pushers and blackmailers that had formerly plagued her existence. Oliver Lugg is a University of Sussex student with a passion for the arts. The theatre correspondent for the University of Sussex newspaper is just the beginning of a formidable career in arts journalism. The scene is set as we take our places – a tiny room, red roses, an accordion on a chair, a framed photograph and a telephone. A red bereted keyboard player looks up at us sadly and we are instantly transported to 1930’s Paris. Enter right Edith Piaf all in black, a single rose tucked behind one ear, and the room is filled with energy and anticipation as she sits and takes up the accordion. What follows is a tremendous journey of highs and lows as we are taken through the loves and sorrows of her life. Aware of the fascinating life story of Edith Gassion, and a great fan of the biographical film “La Vie en Rose”, I was utterly charmed by this intimate one-woman production, which was beautifully staged and full of real life emotion. 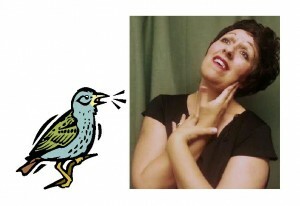 Taking us through reminiscence and song, Laurene Hope is completely believable as The Little Sparrow. The audience are teased and charmed throughout with some of her best loved ballards as if being entertained in a cabaret bar. Encouraged to sing along, we were at time smiling, at times on the edge of tears. This show sold out each night in the delightful Canata Room in the courtyard at the Hotel du Vin, one of my favourite venues. At times naughty, fun, thought provoking and tragic, above all this show is a real joy. If you loved it – or if you missed it – the unabridged version, playing at the Edinburgh Fringe and at the Waterside is a must-see. You will regret nothing – Encore!